Birmingham, a large, bustling city in the West Midlands, is home to one of the most lively gayborhoods in the United Kingdom. Also known as Gay Brum, this vibrant part of the city offers a fantastic scene of diverse and inclusive nightlife. Whatever your orientation, there’s somewhere for everyone to go in the Village for some late-night fun. Read on for our top picks, from old stalwart institutions to the hottest new clubs. One of the longest running bars in the neighborhood, The Village Inn is also one of the most popular places around, open seven days a week and always good for some fun. Open from noon every day, the bar offers coffee for a sober afternoon pick-me-up, plus wine and lagers for day-drinking and beyond. The Inn makes an afternoon pint easy on the wallet with happy hour specials every day until 8pm on weekdays, and until 6pm on weekends. If you’re here after dark on the weekend, head downstairs to the Village Underground, an additional bar on the lower level which features live cabaret shows every Friday and Saturday night. Another of the most prominent bars in the area, Nightingale Club offers a more trendy, contemporary atmosphere. Calling itself a ‘gay superclub,’ Nightingale has three floors with smoking lounges on each level, and boasts one of the largest outdoor spaces in the city. There’s always live entertainment to take in on weekends, whether it be drag shows, DJs, or bands, and the bar now also hosts a street food market called Taste & Liquor every Saturday afternoon. 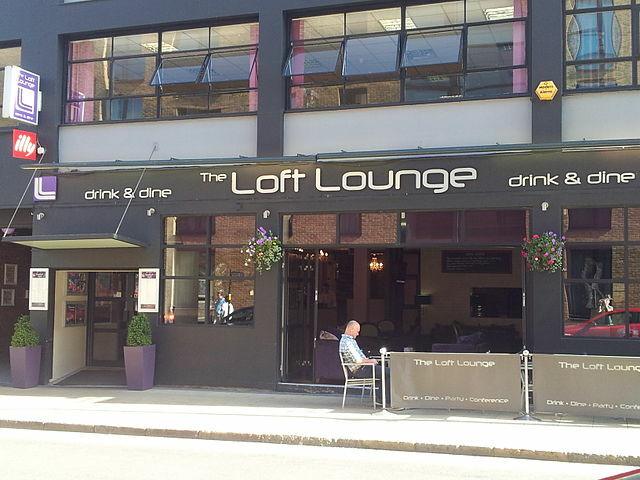 A long running Gay Brum mainstay, The Loft Lounge‘s cozily relaxed atmosphere makes it the perfect place to catch up with friends, either during the day for a coffee or after work for a quick drink. They have a happy hour running most days of the week, and a two for one cocktail special that’s always on offer. With comfy sofas and chairs all around, it certainly is a laidback lounge by day, but the scene here heats up after dark when the DJ gets the dance floor going. Located a bit further away from the town’s center, Eden is a relaxed, trendy bar that attracts a bit of an older crowd earlier on in the night, but becomes more exciting as the evening wears on. As with Loft Lounge you’ll find plenty of comfy chairs and sofas for relaxing; exploring further, you’ll also find an extensive outdoor garden (of Eden) and two stages, one indoors and one outside. The bar books DJs every weekend, and sometimes hosts live performances on the weekends as well. A solid selection of beers and spirits are on offer for relatively cheap prices, and the staff is always friendly. Built in 1897 as a public house, Missing Bar is located in a Victorian-style mansion and was previously known as Australian Bar. This rebranding also resulted in a new label as a ‘party bar,’ complete with Go-Go dancers and DJs most nights, as well as an upstairs Luna Bar setting featuring a spacey spectacle with lasers and mirrored walls. Since it’s on the smaller side you may not choose to stay the whole night as it fills up, but it’s well worth a visit for those looking to bar-hop. Birmingham’s only dedicated lesbian bar, The Fox is an excellent spot for a night out whether you’re looking for a lady or just hanging with friends. 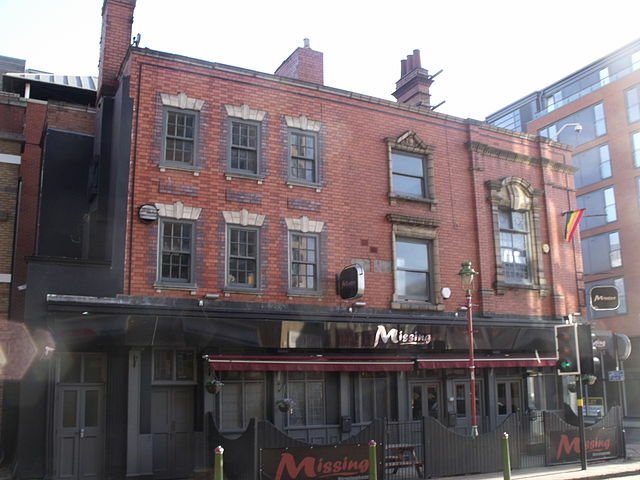 It’s relatively small but well decorated, with black and white prints of Madonna adorning the walls and an outdoor beer garden for a bit of extra space and fresh air. The Fox attracts women of all ages, but men are also welcome and karaoke nights are a blast for everyone. More popular with the guys, The Fountain Inn is true to its name and serves as both a bar and hotel. Its main bar maintains its original design, giving it a ‘retro’ feel; there’s also a more modern pool lounge at the back, with access to an outdoor garden and a ‘men only’ area for those looking to canoodle. Although it caters mainly to men above the age of thirty, women are also welcome here, and it’s a good place to start or end a night out. 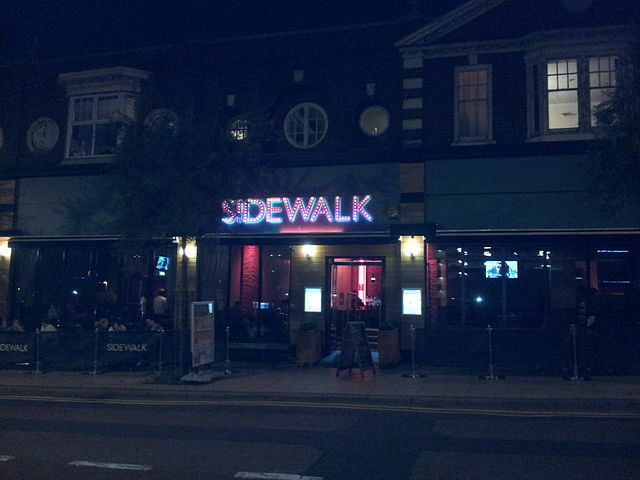 Previously known as Angels, Sidewalk is a stylish, edgy bar with a San Francisco warehouse feel. It was originally a car showroom in the 1930s and still has the huge display windows from those days, as well as a restaurant that has been nicely refurbished and serves two for £10 on select meals during the week. Sidewalk attracts a younger crowd, but all are welcome here regardless of gender or orientation. The friendly staff helps supply that warm and welcoming atmosphere, and their drinks for £1 on Mondays and bombs for £1.50 on Thursdays seal the deal.